Hannah Mermaid is currently sponsored by monofin companies and other water based companies. She designs and creates her own mermaid tails. The Hannah Mermaid brand is able to promote various products very successfully due to her online and media presence; nearly 10 million Youtube views on her channel, over 110,000 followers on Facebook, and thousands of views to her website every week. Hannah is currently working with Emmy Award winning cinematographer Shawn Heinrichs to create mind-blowing imagery that captures her unique connection to marine life in an upcoming documentary - Guardians of the Deep - Tears of a Mermaid. Hannah Fraser's career and vast credits include a wide range of clients in numerous countries around the globe. She has a positive and outgoing personality that shines through her body of work. Atlantis Resort- Bahamas, Omega Watches, Cirque Du Soleil, Village Roadshow, Mirage Hotel-Vegas, Skyy Vodka, Chicago Museum, Cannes Film Festival and many many more. ​​Hannah Mermaid is available for interviews and feature stories, events, photo-shoots, campaigns, spokes-model, film and TV projects. ​For more information or to book Hannah Mermaid please contact us. Hannah is a Real Life Mermaid, who performs and swims around the globe for charity projects and commercial ventures, bringing awareness and exposure to the Ocean environment and it's precious animal life. Fascinated by mermaids since she was a child, she created her first tail when she was only 9 years old. 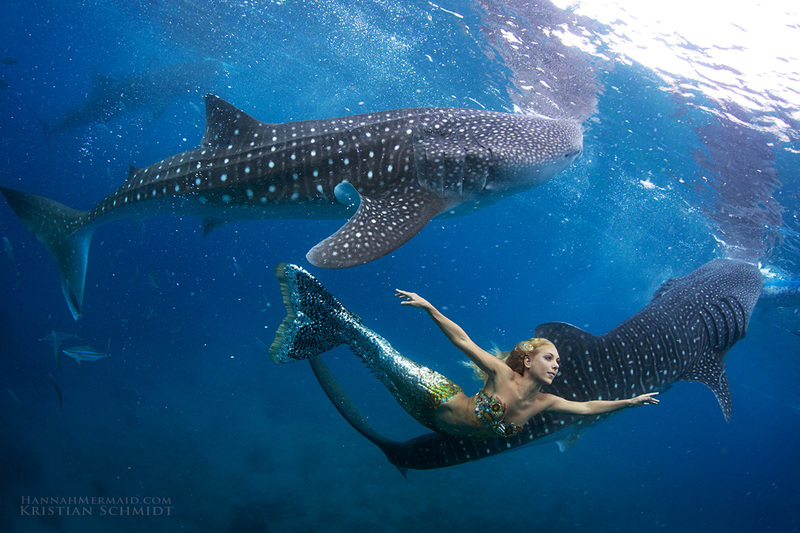 She now creates exquisite mermaid tails and travels the world performing underwater as a mermaid for film, television, advertising, events and environmental activism. Hannah uses her unique link to the ocean to inspire and educate people on the importance of marine life. She is a strong role model of self empowerment for young woman across the globe who see that she has made her dreams a reality, no matter how unlikely the odds! Hannah has been featured in many advertising campaigns swimming in the open ocean with tiger sharks, dolphins, whales, seals, manta rays, and has given talks to thousands of people for numerous large scale events on ocean conservation and underwater performance. Hannah has worked with some of the best underwater photographers in the world, including award winning cinematographer Shawn Heinrichs. They are currently working with McTraxMotion on a documentary featuring her underwater work as a mermaid, due to release in 2015, titled 'TEARS OF A MERMAID’. Hannah is also featured swimming with great white sharks in a documentary titled ‘Beyond the Cage of Fear'.